Bricks are fired clay blocks. Quality and Colour of bricks vary from region to region mainly due to different types of soils being used. Brick quality and colour also depend on the additives, firing technique and temperature. The colour of brick is a primary indicator of its soundness. Under burnt and low temperature fired bricks are more absorbent compared to over burnt and high temperature bricks. 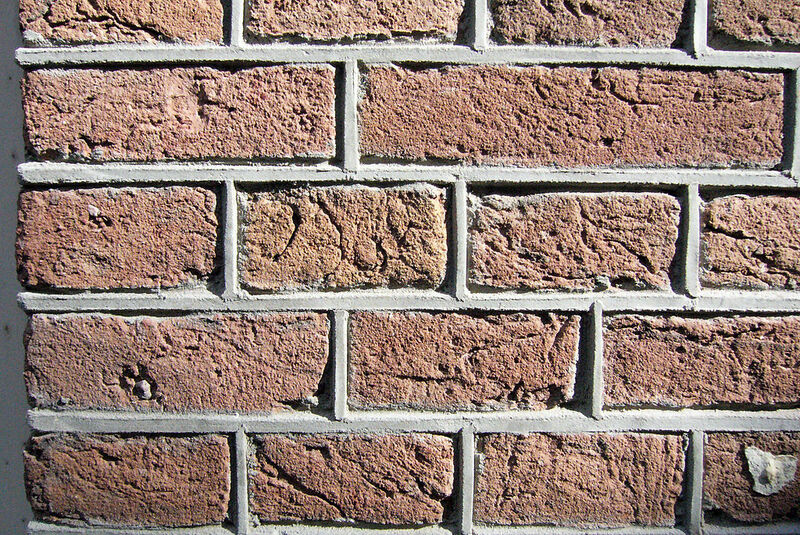 Hand-pressed bricks are less compact than machine-made bricks, and as a result absorbs more water. Hollow and perforated bricks are extrusion-machine cast by from wet and plastic mass. Roofing tiles and facing brick tiles are die mould-cast from slightly less wet mass. Exposed bricks surfaces are created for its decorative appeal and also as the inevitable surfacing. Exposed brick surfaces (un-plastered brick masonry surfaces) of walls, floors and occasionally the underside of roofs (Jack-arch roofs, domes and arches) are created with uniform brick colour and texture or sometimes with slight variegated shading. Bricks of exposed masonry surface, if permeable allow bacterial growth such as mould, fungi etc. on the surface. Soluble salts present in the clay, usually get decomposed during the burning but immediately after highest temperature of firing and while cooling, sulphate of sodium, calcium, potassium and magnesium are formed with the help of sulphur from the fumes of the fuels. These salts on contact with absorbed moisture leach out on the surface. Most of the sulphate gets washed away from the masonry surface, but magnesium sulphate does not leach out readily. It expands and causes crack in bricks. Calcium sulphate though not easily leached out, settles on the surface to form whitish scum. Porous and rough brick surfaces are better for mortar adhesion than an impervious smooth surface of a very vitrified brick, Over burnt or highly vitrified bricks have very low suction capacity for mortar binding. Over-burnt bricks are dimensionally deformed due to running of the mass and unsuitable for masonry work. Next to the Bricks self colour, texture and quality, the quality of the masonry surface is characterized by the joints. The colour of the joint material, its pattern gives a different look to the wall masonry or flooring. The joints are racked (deep grooved), flushed or projected out, all with selective emphasis on horizontal or the vertical. Flushed with string mark type of pointing is considered best, however for dramatic effect racked and projected joints are preferred. Unlike the projected or grooved pointing, flushed pointing does not retain dirt or water in its holds. The string marks are adequate guide path for any hair crack that may develop in the joints. The masonry inter joint material and the joint surface pointing material both must surpass the overall performance of the bricks. High adhesion, low permeability and suitable colour matching are some of the attributes of a good jointing-pointing material.